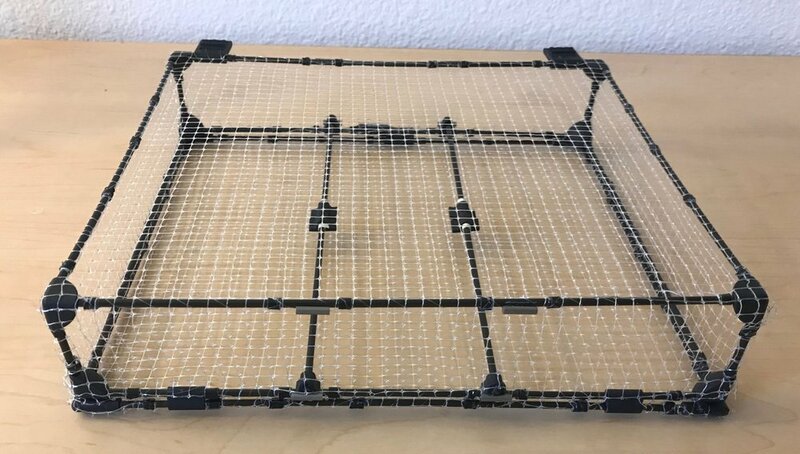 In this post, I will show you how you can build a safe cage for your drone. I’m assuming that you either own a commercial drone or have built your own already! If you want to learn more about the specifications of the custom drone that we have here, check out our research paper and video. The first thing you want to do is to make sure that your drone can actually carry additional weight. For certain commercial drones you can find this information online – just search for “carrying capacity” of your specific drone. Or you can design your own experiment: tape some additional weight (you can use coins) to the body of your drone and try flying it. To find the maximum weight limit, gradually increase the added weight (by adding more coins) until it is no longer stable during flight or can’t take off. You can also look through online forums to see if someone has already tried obtaining these measurements for your drone. If you find that your drone cannot carry enough weight, then it’s not really practical to build a safe cage for it, at least without modifying the drone itself. “Enough weight” depends on the size of your drone and the design of the cage, but my cage weighs about 80 grams. The main things you will need are carbon fiber tubes (I purchased the “Carbon Fiber Tube, 1/8" OD, 0.072" ID, 4 ft. Long” from MacMaster), access to a 3D printer (I used the Formlabs Form2 3D printer), and a mesh netting (I used the 6’ x 4’ Clear Mesh Netting on Amazon by Far Edge Aquatics). You will also need some tools for safely cutting the carbon fiber tubes (more on this later, but I used a face mask, gloves, and a hand saw), as well as measuring tools, crazy glue, duct tape, and fishing line. The first thing you want to do is to measure the dimensions of your drone along different axes. Draw a diagram of how you want your cage to look like. Add the dimensions of your cage to your diagram and make sure you leave enough room above, below, and around the propellers, so they can spin freely. I had a relatively small drone, so I chose a simple rectangular cuboid design for the main part of the cage. To attach the frame securely to the body of the drone, I added two parallel carbon fiber tubes to the bottom of the cage. I also added a rectangular frame to the bottom of the main cage to act as a lid, allowing me to open the cage and change the battery. The next thing you want to do is design your joints. You can download the 3D model of the joints that I have used here and 3D print them, or you can use a 3D modelling software to design your own. I have a few different types of connectors. There are 8x joints for the corners of the main frame. These are 1/8ths of a sphere, to prevent them from breaking easily. There are 4x flat joints for the corners of the lid. 2x hinges for attaching the lid to the frame. 2x flat pieces for closing the lid. 4x connectors for attaching the two parallel tubes to the main frame. And finally 4x connectors for attaching the two parallel tubes to the drone. Depending on your drone, you may need a different shape and size connectors to attach the cage to your drone - you want to think about this now, and not after you have assembled the cage. In the photo above, ignore the two hanging connector on the top - those were designed for our specific application. Then you want to use your diagram and measure the length of each piece of carbon fiber tube that you need. Make sure to account for your 3D printed connectors and cut the tubes shorter than the length of the sides of the overall frame. I used a white masking tape to roughly mark the points that I wanted to cut. I then used a pen to mark the exact position on top of the masking tape. Make sure to account for the few millimetres of carbon fiber that you will lose when you cut them. Once you have measured and marked your carbon fiber tubes, you need to cut each piece! To do this, I used a hand saw while a friend held the carbon fiber tube on the edge of a table. You may be able to use a clamp, but it might break your tube. WARNING: Cutting carbon fiber tubes can be very dangerous!!! Make sure to do your own research before attempting to do this. Particularly, you want to prevent any carbon fiber dust from entering your lungs and you also want to avoid touching the cut pieces of carbon fiber. I did this outside, and I wore a long sleeve shirt, gloves, a mask, and safety glasses during the process. I did not have the proper type of mask, so to prevent any dust from forming, I used running water on the carbon fiber tubes when cutting them. Again, be sure to do your own research! After cutting, while keeping the gloves on, I sanded off the ends of each cut piece and used some super glue to seal them. Now that you have all the pieces that you need to build your frame, it’s time to assemble. For this you will need your 3D printed connectors, cut carbon fiber tubes, and super glue (I used the Loctite gel control super glue). 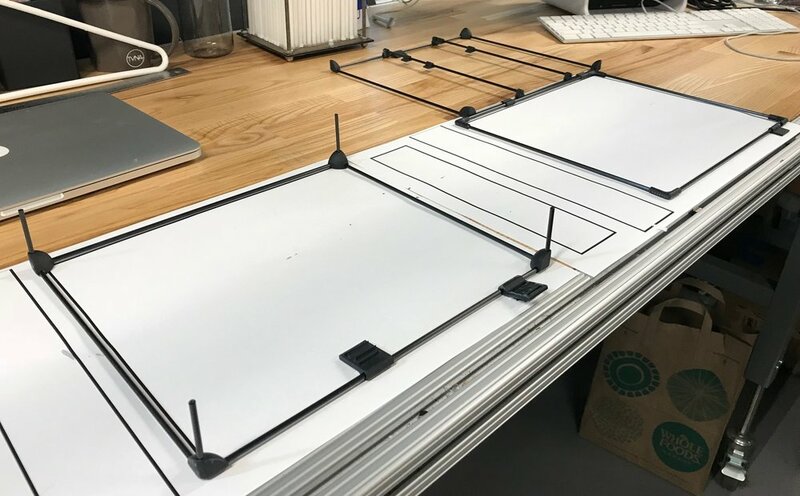 To ensure that all the sides are at a right angle, I recommend printing the exact shape of your frame and using that as a template for your assembly. You want to place a small amount of glue in each connector (one at a time) and begin assembling. To speed up this process, I used a super glue accelerator. If you choose to use an accelerator, be sure to follow its safety instructions. It’s time to wrap the mesh around the frame! The first thing you want to do is to measure and cut the mesh netting. I cut one piece for the main frame (covering the top and the four sides) and a separate piece for the lid. To attach the mesh to the cage, I started by wrapping a few thin pieces of duct tape (3 or 4 thin strips per edge) around the carbon fiber tubes and through the holes of the mesh netting. You want to pull the mesh as much as you possibly can, before taping it to the carbon fiber tube, to make sure that it’s entirely in tension. After that, I used fishing line to sew the mesh all the way around the frame. This may be an optional step, but it helps with pulling the mesh even further, and it prevents it from buckling between the points that have been duct taped. Sewing also allows you to wrap the edges of the mesh inwards and remove any sharp edges. Now that you have a complete cage, the final step is to attach the drone. I used the 3M double-sided Very High Bonding (VHB) tape to attach the 3D printed connectors (the 3D printed parts that we placed on the two parallel tubes) to my drone. Depending on your design, you may have to think of other mechanisms for securing the cage onto the drone. I also added four pieces of foam to the bottom of the cage to protect it during landing, and glued velcro onto the two flat pieces to close the lid. But is it truly safe? Not really! The term “safe cage” only implies that when you accidentally touch the drone, the meshed cage is likely to prevent you from touching the spinning blades and potentially cutting yourself. But keep in mind that the cage you build is likely to be less durable than your drone. So, if the drone crashes, with high enough impact force, the cage will probably break, and the flying pieces of plastic and broken carbon fiber rods could be really dangerous! In my experience, during a high impact collision, the plastic joints broke and the mesh wrapping held most of the broken components together so they didn’t shatter everywhere, but be careful! Is this the best safe cage design? Definitely not - this is just a functional prototype that was good enough for our particular use case! I encourage you to explore other options. In fact, I arrived at this design after iterating on many cages for different commercial and custom drones. You can see some of them below: I started from laser cutting foam core into a lattice structure, then built cylindrical wooden frames, and finally iterated on different carbon fiber frames. Another design might work much better for you, especially if your drone has a different shape, size, or carrying capacity. I hope I have inspired you to build your own safe drone cage! If you have any questions feel free to ask, and if you make your own cage tag me on social media so I can see your awesome designs! I also encourage you to check out our research paper and video to see how we’ve used this safe drone for haptics in virtual reality!